Taste the New Exodus Burger @ the Official “Blood In, Blood Out” Listening Party at Kuma’s Corner in Chicago, October 12th! at Kuma’s Corner in Chicago, IL this Sunday, October 12th! Whether you prefer your burgers rare or well done, fans attending the official EXODUS listening party at Kuma’s Corner on Sunday October 12th will get a taste of Blood In, Blood Out in more ways than one! Come listen to Blood In, Blood Out on loop whilst enjoying the brand new, exclusive EXODUS Burger at Kuma’s Corner in Chicago, IL, this Sunday from 7:00-10:00pm. The listening party will also include awesome EXODUS merch giveaways. 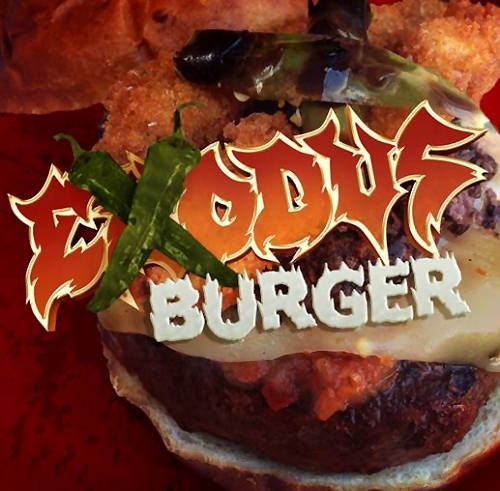 The EXODUS Burger is being served up in celebration of the impending release of the band’s 10th studio album, Blood In, Blood Out, out October 14th via Nuclear Blast. Legions of metalheads and foodies unite to listen to the new record and taste a burger that can only be described as food for the fans (see track 11). So what’s in the Kuma’s Corner EXODUS Burger? Your tastebuds are about to rocked – the EXODUS Burger features a 10oz burger patty, fried veal strips, Arbol chile salsa, black rice and bean cake, Pepperjack cheese, and roasted Serrano peppers. Delicious! Kuma’s Corner opened in 2005 and has since then taken great pride in supporting the heavy music community. Kuma’s Corner has created burgers in the name of countless other world-renowned metal bands like Black Sabbath, Metallica, Iron Maiden, Pantera, Slayer, High on Fire, Mastodon, and more. Visit Kuma’s Corner online at www.kumascorner.com.